Dubraska has been sitting down outside this ambulatory care center for hours, waiting to see if there is a vaccine her 11 month-old baby needs is available here. The 22-year-old makes daily searches to find medicine for her baby. Her situation is common for many mothers and young woman in Venezuela. And it’s one reason many are considering sterilizations. Thinking in our situation and considering to the obligation, because bringing another baby into this world in these circumstances is not fair. In the maternity center in Caracas, Lilisbeth expects to be treated for a medical condition before her due date. This is the second hospital she visited that day. I’m thinking about sterilization if I end up having the baby through c-section or a natural birth. I’m considering it. 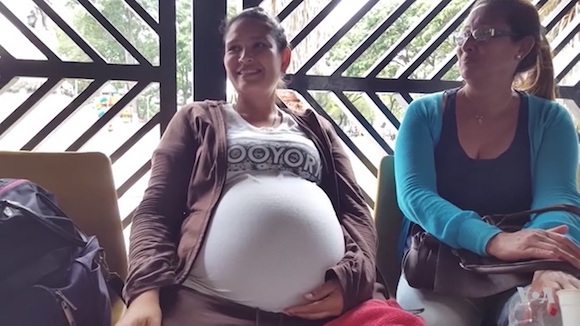 Even though Venezuela has a free health system, expectant mothers must bring their own supplies to their hospitals including things like syringes and catheters. We don’t have money to support our children. We don’t even have the money to support ourselves, let alone pay for a tubal ligation. And find them the medicine they need is almost impossible. The medicines that were prescribed for my cesarean operation, I can’t find them, I can’t find anything. And I have to buy them. If I don’t, I’m going to rot inside. Problems continue after the baby’s born. Formula cost around 9 dollars, 15 days of minimum wage and a pack of diapers takes the equivalent of four days of pay. Milk and diapers are almost non-existent and if you find them they’re really expensive. The price of contraceptives is also rising. 3 condoms cost Venezuelans 2 days of work at the minimum wage. You can’t place an intrauterine device because it costs a lot of money. This year, Venezuelan President Nicolas Maduro approved given each pregnant woman 6 dollars a month in assistance. We’re going to protect all pregnant women. The Pan American Health Organization rated Venezuela as the country with the highest algorithm pregnancy rate in South America, with a total of 80 unwanted pregnancies for every 1000 women. For Adriana Nunez Rascal in Caracas Venezuela; Christina Caicedo Smith VOA News. They should sit down to talk out their differences. We cannot wait to be rescued.